Boho City: fuss-free ethical fashion! If we want ethical fashion to become the norm, then it's important to make sure that it's normal to buy ethical fashion. Stay with me here. We are, as consumers, both savvy and lazy. We'll happily hunt down a bargain, but won't bother to figure out why that must-have dress is so cheap. From this fundamental split in logical thinking, fast fashion has grown, like a weed fed on blood and bone. Excuse the purple prose, but you get where I'm coming from. If we want the people who make our clothes to be fairly treated, and for the processes by which those clothes are made to be environmentally friendly, then it's important to encourage retailers and manufacturers who stand by those values. Business is not a charity, and needs our money to survive. At the same time, the process needs to be normalised. It should be simple and fuss-free to buy ethical fashion, and it shouldn't be seen as a special or limited edition. Kudos to brands like H&M for launching concsious collections, but surely the whole stock should have those ethical credentials. All of which is a bit of a long-winded preamble to the point of today's post: Guru Ian pointed me at a rather good new online store that focusses entirely on ethical fashion. Boho City is designed specifically for the 21st century fashionista who wants her fix at the click of a mouse. We're buying more and more of our fashion online these days. Well, why shlep out to the shops when you can have your goodies brought to you like you're some futuristic princess with a horde of magical clothing pixies to do your bidding? The point is that we're used to this sort of thing--Amazon and Asos has spoiled us, and we now expect a flawless, wide-ranging experience when we shop online. This model is one into which ethical fashion slots beautifully. Low start-up and premises costs, and availability to a global marketplace means that, as long as the experience is smooth and easy, it's equally frictionless to get people spending their money on clothes that are fairly produced and non-toxic. Boho City are smart to realise that there's no need to push the eco-fashion credentials: just sell great clothes that happen to be produced in the right way. Their fun, girly e-store cleverly pushes the brand as festival-friendly. As we're coming up for the biggest show of the season, Glastonbury, this is a very smart move indeed. If Boho City succeeds (and here at the Pier we certainly hope they do) then that's another step towards a simple goal: affordable ethical fashion for all. We know the story. Impoverished garment workers caught in a struggle for fair pay and conditions against a corrupt and greedy management, bankrolled by a distant multinational who only cares that the contracts go out on time and budget. I've told it on the blog so very many times. The thing with any perceived truth is that it's never the whole story. A recent strike by factory workers in China twisted the tale in a very surprising way. Employees at Taiwanese shoe manufacturer Yue Yuen downed tools after finding out that the company had been underpaying its social security contributions. Thousands walked out in a strike that's being called one of the biggest in the history of industrial action. But it was supervisors who first noticed the issue, and confronted senior plant officials over the problem. Even more unusually, some of the big-name Western brands who had a lot to lose from the Yue Yuen walkout sided vocally with the workers. Both Nike and Adidas have made it clear that they would not move production from the plant, choosing instead to support the strikers. "With respect to the arrest of two workers' representatives, Mr Zhang and Mr Lin, we were engaged with several labour rights groups in Southern China, to try to determine where they were being detained and offered our support to secure their release. We also wrote to the Dongguan mayoral office, calling for his immediate release." Despite the heavy financial hit to Yue Yuen, estimated at $27 million, it's fascinating to see the big names siding with workers in industrial disputes. Let's not kid ourselves that this is the dawn of a new caring sharing corporate structure. But the multinationals are starting to see, I think, that it's in their own best interests to keep skilled garment workers happy and healthy. Strikes are bad for business. It makes sense to stop them happening, and if that means putting pressure on the factory owners to pay and treat their workers fairly, then so be it. It's heartening to see corporate pressure flexing in the right direction for a change. Last week saw the final nail knocked into the coffin of David Cameron's Big Society. It's been coming for a while: coalition austerity measures have created a steady erosion in charity donations, while cuts to public services have meant that those charities are expected to do more. The notion that "we're all in it together" has been laughable for a while, but recent developments have turned the phrase into a sick joke. In fact, the very opposite seems to be true now, and we're seeing government and the third sector squaring up for a fight. Referrals to food banks have spiked to levels unseen since the lean years after World War 2. That's an unfortunate statistic for a government desperate to claim that austerity is working. It's a message that they would prefer to have disappeared. The Trussell Trust, the voluntary body in charge of administering the broad majority of food banks has, according to evidence given by its head, Chris Mould, to the Panel on the Independence of the Voluntary Sector, been told to keep quiet about the numbers it refers to help. Aides working for The Department of Works And Pensions have, according to Mr. Mould, twice warned the Trust that if they continued gathering data and published it, there could be dire consequences. The DWP has also forbidden Jobcentres from accepting Trussell Trust vouchers, which have a questionnaire listing the reason for referral on the back. 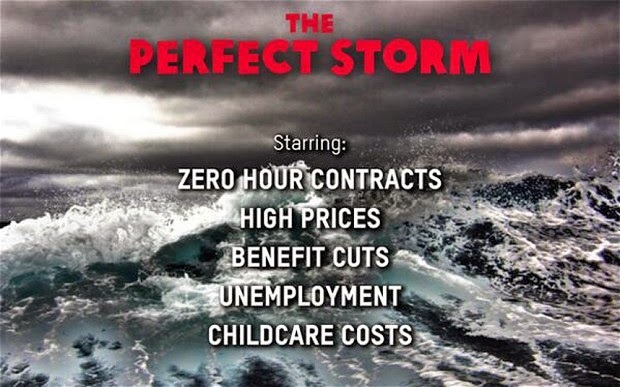 Meanwhile, Oxfam has been reported to the Charities Commission by Tory MP Conor Burns for their latest ad campaign, which makes explicit the massive increase in poverty and homelessness under the coalition. Burns claims that the campaign is overly political. He's right, of course: a spike in the numbers of people struggling to make ends meet is a clearly political issue. But that's not what he means. He just wants to shut Oxfam up for revealing facts that are deeply uncomfortable for the government. The claim that charities are becoming politicised is one that the coalition are making more and more often. Ian Duncan Smith, the Minister for Works and Pensions, refuses to meet with the Trussell Trust for that very reason. The thing is, of course, that charities are set up to highlight and struggle against inequality. If government policy is a direct cause of that inequality, then it's only proper that charities should say so, however inconvenient it is for the coalition's preferred narrative. The Cameron notion of government, charities and volunteers working together to make a better Britain have been shown time and time again to be a sham. Now we're seeing the ugly, bullying face of a political class confronted with charities that cannot stay silent about the abuses they see on a daily basis. As the government start discussing a new programme of compulsory public work that every school leaver will be signed into--effectively a revamped National Service--I think the time has come to disabuse ourselves of the notion that the Big Society was ever anything but a big fat lie. Cambodian garment workers, caught in a struggle against government forces and vested outside interests, have found a new way to voice their demands for fair pay and decent working conditions. Last month, they staged a fashion show with a difference. Following protests in January that led to the shooting deaths of five workers by police, a group from the United Sisterhood Alliance decided it was time to show the world not just the injustices and abuse, but how they're coping with the pressure on a daily basis. A fashion show was an ideal way to highlight their bravery and ingenuity in the face of oppression. The show, Beautiful Clothes, Ugly Reality, was a mix of fashion, performance art and dance. Factory-made Western brands were modelled by pretty models, and the event culminated in fake riot police rushing the stage and "shooting" one of the girls on the catwalk. The message couldn't be clearer--fast fashion comes at a heavy cost to those on the factory floor. "The event may have seemed like a harmless way for the women to express themselves, but when you’re standing up for yourself, even a fashion show has its risks. A few of the organisers actually missed the majority of the show, as they were outside negotiating with police to allow the event to continue. Thankfully it was allowed to go on, as many of the workers had given up a few of their evenings to rehearse – coming to the venue straight from their shift at the factory and sleeping there overnight. It seems like whenever these workers make a gain, something new gets thrown at them, but it’s the organisers’ hope that as more women see their coworkers at events like these, more and more will be willing to speak up about the ugly reality they face." That's our hope as well. These garment workers want nothing more than to be treated fairly and paid a living wage. When these simple requests are met with riot shields and rubber bullets, it's time to stand up and ask what's going wrong. Well, kind of. We don't have the exact date to hand, but we do know this: in June 1994, Gerry Hayter changed the name, location and ethical direction of his promotional-wear company, Headline. It became Pier32, and it's still going from strength to strength today. In celebration, Gerry let me out of my small room at the end of The Pier, and we chatted about the history of Pier32. Rob: What inspired you to change from Headline to Pier32? Was there a specific event, or a general feeling that you needed to change direction? Gerry: Headline was based in Soho, right in the middle of London, but we noticed in the early 90s that many of our clients were moving out of the west end to Putney, Hammersmith, Brentford and Heathrow. 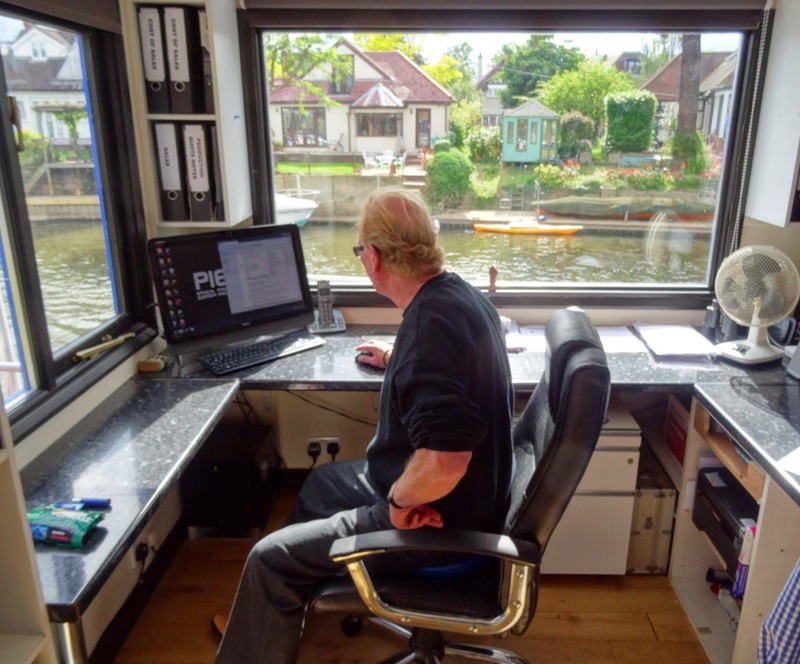 We decided to follow them, and moved to Thames Ditton, right on the river (to be strictly accurate, we're *on* the river, as our offices are on Thames Ditton Island). We decided then to not only move our base but also re-brand. My wife Dixie coined the name Pier32, which suited the location. We found that we were increasingly being asked for ethically produced, environmentally friendly products which we sourced and then imported. It made sense from a business and an ethical standpoint to reposition Pier32 as one of the first companies to only deal in ethically produced and environmentally friendly promotional wear. 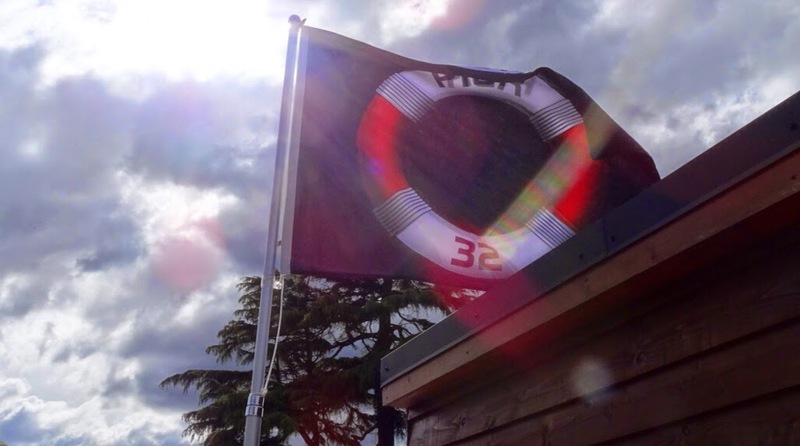 Rob: Are there any highlights or moments in the 20 years of Pier32 that have made you particularly proud or happy? Gerry: Our involvement in the 2005 'Make Poverty History' campaign was a real highlight for me. We supplied many of the charities involved with ethically produced, environmentally friendly promotional merchandise. We also provided 250,000 ethically produced environmentally friendly printed fabric swatches which were then personalised with a message by 'Make Poverty History' supporters and left on the hill at the 31st G8 Conference held at Gleneagles, Scotland. Seen together, they were one heck of a sight! Rob: What is it, do you think, that makes Pier32 special? Gerry: Pier32 is very much a family-run business. My son-in-law Ian is the marketing director, and most of us are involved in one role or another. We're not at all corporate or stuffy and we believe in the personal touch. There's a good chance when you pick up the phone to talk to us, you'll get through to me. You don't get to your twentieth birthday as a company without doing something right, and Pier32 aren't just surviving--we're thriving. I'm proud to be working with Gerry, Ian and the rest of the Pier32 family. Raise a glass with me as we welcome the next twenty years of ethical goodness. And, as a treat, behold! The actual View From The Pier. Not a bad place to work, is it? This summer, reach for the Summit! If you're an active type like me (quiet at the back there) you'll be on the lookout for new outdoor clothes to help you make the most of the gradually improving weather. Say, then, you decide to do a little last-minute hiking or hill-walking, and find out that old pair of walking boots just isn't going to do the job. Problem, right? Well, a new social enterprise specialising in outdoor clothes might just save the weekend. Summit Clothing offer a rapid response time and can deliver all orders placed before 7pm the next working day. The website sells top range brands for hiking, climbing, mountaineering, camping and general outdoor adventuring, which can be delivered in record time ready for last minute trips. “Summit Clothing is breaking the boundaries and perceptions of a small social enterprise, by offering the exact same products and services as other businesses. We have even gone a step further than many of our competitors by offering next day delivery before 7pm and unrivalled customer service. Summit Clothing offers the same top quality brands and improved service compared to other adventure stores, but the main differentiation is our ethical values. So far, Summit have teamed with iDID Adventure, helping kids from disadvantaged backgrounds to enjoy a holiday in England's wide open spaces. They plan to partner with a range of companies to supply water filters to remote communities in Nepal who currently have no access to clean drinking water. But there's no compromise on quality or choice either, as Summit supply top-name brands like Mountain Hardwear, Grivel and Montan. I'm about to make a confession. It's not something of which I'm particularly proud—in fact, as the author of an ethical fashion blog, it's frankly embarrasing. I don't know how to sew on a button or fix a patch onto a worn pair of trousers. Yes. Yes, I know. It's pathetic. It's not that I don't know how to do it in theory. It's not like I haven't tried. But somehow, my buttons drop off, my stitchwork unravels. I have perfectly good jeans in the wardrobe that I simply can't wear due to holes in unsuitable places. Now, I have two options. Well, three, if you count going cap in hand to the mother-in-law, but let's not invoke the nuclear option quite yet. In my home town of Reading (jewel of the Thames Valley) an actual honest-to-goodness alteration and repair shop has recently opened, presumably to cater to clueless goofs like yr humble author. Better yet, the phenomenon of Repair Cafés that I wrote about last year has reached our neck of the woods, and meets regularly. The next one will be held on the 15th of June in the old Jackson's building—worth a look if you have clothes, electronics or tools that need fixing (or indeed, if you're interested in proper old department stores in a stripped-out state). More on that here. But all this is local news, and doesn't address the issue at hand—what if I wanted to repair my clothes myself? Well, Droog, a Dutch design shop with an admirably quirky sensibility have just the thing. Create Me Textile is a sheet of pre-cut shapes in different colours with an iron-on backing. They make repairs a piece of cake, and are perfect for adding a little angular Euro-style to tops and bottoms that maybe need a little freshening up. The pack is €20, which is, I'll grant, a little on the pricy side. But when you compare that with the humiliation of going to the mum-in-law with a sack of holey jeans, it suddenly seems worth it.